interested in learning some watercolour techniques in a relaxed and friendly environment? These six workshops have been devised to guide you through some basic techniques and give you the confidence to ‘have a go’ at some of the more challenging aspects of watercolour. ideal for complete beginners or those wishing to progress a little further with their paintings. 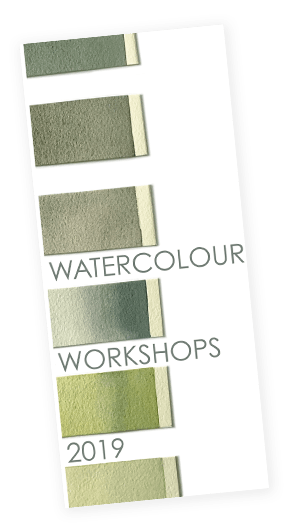 together the six workshops will give you a great start on your watercolour journey or alternatively choose individual workshops that particularly suit your need. Have no fear! A workshop designed for complete beginners. We will be using a limited palette with limited possibilities. We all love colour. Let’s mix some. Learn how t be confident with colour in oder to enhance your paintings. We will be painting some still life. Perfecting this skill – quoted as being “75% of watercolour technique”. 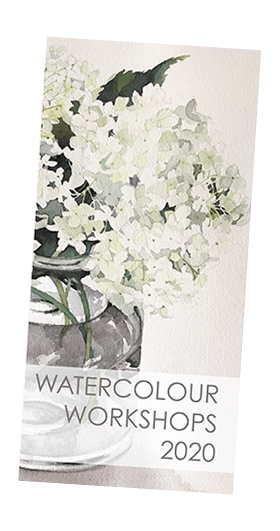 By the end of this session you will be three quarters on the way on your watercolour journey. how to mix subtle natural greens rather than relying on ready mixed tubes. Trees – an endless subject matter. We’ll look at a tried and tested method of painting trees and a loose and fun one too. Understanding the information required in your sketches and transforming those earl marks into a painting. Tips on working from photographs too. Not all blues are cool and not all yellows are warm. Let’s demystify this conundrum Learn how to incorporate warm and cool colours to great effect in a landscape composition. If you would like to take part in any or all of these workshops, please contact me using this form with the workshops you like to attend. Express yourself through paint and let your creativity loose. Celebrating the seasons. Six watercolour workshops designed for those wishing to try some fresh experimental techniques alongside some tried and tested ones. the beautiful english countryside is a constant source of inspiration to artists and we are going to use the changing seasons as a guide to dictate the subject matter for each individual workshop. Together these six workshops form a cohesive package of techniques but feel free to book individual workshops or the ones that particularly appeal if you prefer. Let’s paint our evocative landscape with these instantly recognisable trees taking centre stage. The sculptural forms of dormant plants are an artists’ delight demanding strong and stylish compositions. We are not talking delicate here. Our paintings will be bold and vibrant, loose and free. Looking at a bluebell wood with a fresh approach as we capture that magical time of year. Think apple blossom, cow parsley, cows and sheep. An oppotunity to interpret this title in all its guises. Blowsy roses and hydrangeas abound. Let soft colours merge and blend and watch these flowers emerg from your paper.